I know I have said things about coupes before, and I’ll repeat I: no matter how badly the industry wants it, coupes have two doors, not four. I don’t know how many times I have seen references to four-door coupes in the last couple of years, but it has been a lot. For example, Porsche is now calling the Panamera its performance sedan. Early in its life, more than one news release referred to it as a four-door coupe. It’s true. And, not too long ago, I saw a copywriter who called the Panamera, coupe-style sedan – now that is an oxymoron if I have ever seen one a coupe-sedan. What’s next, a pickup-SUV-coupe? VW keeps calling coups sedans, why? Moving along from this, Porsche is not the only one of Volkswagen’s subsidiaries that has this fetish for the word coupe when it should be calling a car a sedan. 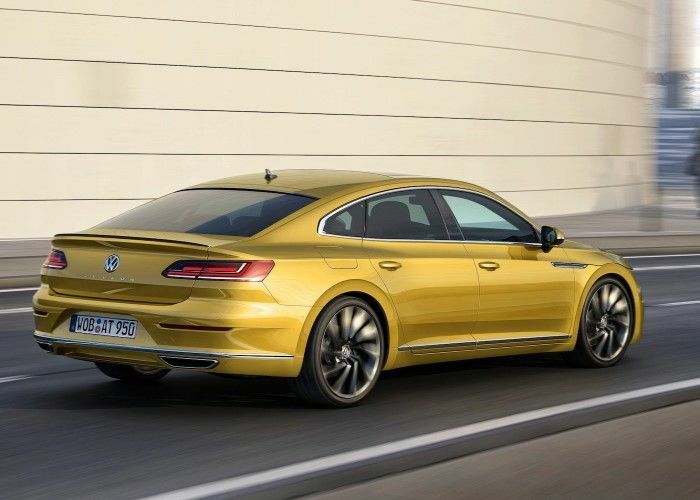 With the Arteon about to join the VW brand lineup in the U.S., a recent news release called the sleekly rounded top-of-the-line, luxury sedan a coupe, despite the fact that it has four doors and despite the fact that VW’s copywriter should know better. So, let’s here it for those in the industry who know what a coupe is and who knows what a sedan is and who also realize that never the twain shall meet. Four can’t be two and two can’t be four no matter how hard you wish for it! About the only time, I have ever heard of wishes coming true is in “The Wizard of O” with the late Judy Garland as the lead. It’s at the end of the movie where she wants to go home and see her Uncle and Aunt in Kansas when the Good White Witch tells her to “Wish very hard and click your heels together,” and the wish would come true. Well, that was a movie from 75 years ago, and this is now, and the VW Arteon is a luxury sedan, not a coupe. Indeed, according to VW’s chief Hinrich Woebcken, the Arteon is replacing the Passat-based CC in the VW lineup. The soon-to-debut model is VW’s return to the luxury sedan field in a spot occupied by the slow-selling CC. VW based its flagship on the automaker’s flexible MQB platform that underpins every model from Golf to Passat and now the flagship Arteon. “Arteon has the style and performance of a luxury Gran Tourismo [model] for about the price of a fully loaded midsized sedan,” Woebcken said in an interview at the recent Chicago Auto Show. The sculpted Arteon is about six inches longer than the CC. The graceful roofline meets the rear spoiler on the trunk, and a pair of LED headlight arrangements finishes off the front end. The front end also features a chromed grille while the greenhouse is set off by frameless contoured windows. Typically, the Arteon rides on a set of 18-inch wheels and tires. A selection of 19-inch wheels is available. Since the Arteon is longer than the vehicle it replaces, it features more interior space and is thus more comfortable for the driver and passengers. The dash displays are a mix of old and new technology. The nod to the past is an analog clock at the top of the dashboard. It contrasts with the eight-inch multimedia screen. The tech package features Apple’s Car Play, Android Auto and more. The standard upholstery is leatherette, though Nappa leather is available. The ventilated ventilated memory seats help keep the driver in place for better control during cornering or handling a new line out of a corner. As befits its position as VW’s flagships, the Arteon has a premium sound system, panoramic sunroof and, among other things, power trunk opening and close. The Arteon’s powerplant is a 2.0-liter, four-cylinder direct-injection system that turns out 268 horsepower and 250 pounds-feet of torque. The engine mates to an eight-speed automatic, the Arteon’s only transmission. A rear-whee-drive model, the Arteon also features all-wheel-drive, using VW’s 4Motion® system. An adaptive damping system helps keep the wheels right where they belong for optimum handling. No pricing is yet available.